SUMO conjugation to protein substrates requires the concerted action of a dedicated E2 ubiquitin conjugation enzyme (Ubc9) and associated E3 ligases. Although Ubc9 can directly recognize and modify substrate lysine residues that occur within a consensus site for SUMO modification, E3 ligases can redirect specificity and enhance conjugation rates during SUMO conjugation in vitro and in vivo. 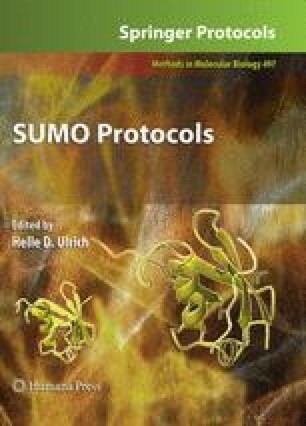 In this chapter, we will describe methods utilized to purify SUMO conjugating enzymes and model substrates which can be used for analysis of SUMO conjugation in vitro. We will also describe methods to extract kinetic parameters during E3-dependent or E3-independent substrate conjugation.